We've published this banner in solidarity with the hundreds of companies who are voicing their support of net neutrality. Net neutrality regulations ensure that web users are free to enjoy whatever sites they choose without interference from Internet Service Providers (ISPs). These protections establish an open web where people can explore and express their ideas. Under the current administration, the U.S. Federal Communications Commision favors less-strict regulation of net neutrality, which could drastically alter the way that people experience and access the web. 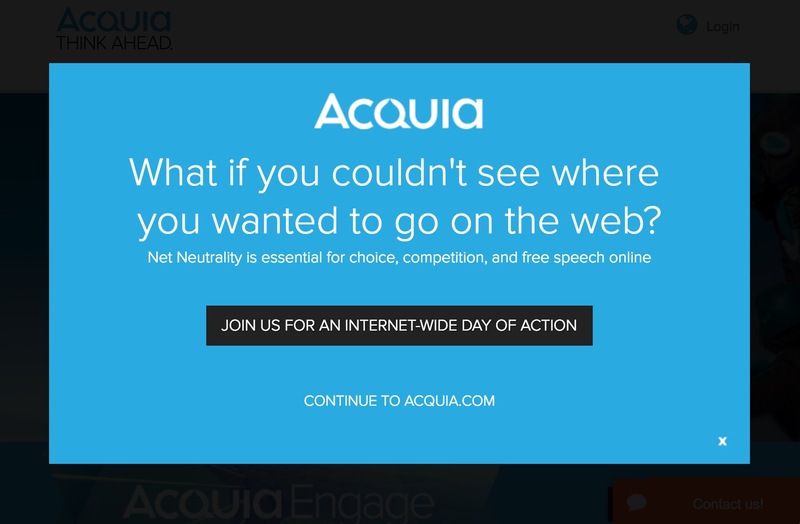 Today, Acquia is joining the ranks of companies like Amazon, Atlassian, Netflix and Vimeo to advocate for strong net neutrality regulations. In 2015, the United States implemented strong protections favoring net neutrality after ISPs were classified as common carriers under Title II of the Communications Act of 1934. This classification catalogs broadband as an "essential communication service", which means that services are to be delivered equitably and costs kept reasonable. Title II was the same classification granted to telcos decades ago to ensure consumers had fair access to phone service. Today, the Title II classification of ISPs protects the open internet by making paid prioritization, blocking or throttling of traffic unlawful. The issue of net neutrality is coming under scrutiny since to the appointment of Ajit Pai as the Chairman of the Federal Communications Commission. Pai favors less regulation and has suggested that the net neutrality laws of 2015 impede the ISP market. He argues that while people may support net neutrality, the market requires more competition to establish faster and cheaper access to the Internet. Pai believes that net neutrality regulations have the potential to curb investment in innovation and could heighten the digital divide. As FCC Chairman, Pai wants to reclassify broadband services under less-restrictive regulations and to eliminate definitive protections for the open internet. In May 2017, the three members of the Federal Communications Commission voted 2-1 to advance a plan to remove Title II classification from broadband services. That vote launched a public comment period, which is open until mid August. After this period the commission will take a final vote. I strongly disagree with Pai's proposed reclassification of net neutrality. Without net neutrality, ISPs can determine how users access websites, applications and other digital content. Today, both the free flow of information, and exchange of ideas benefit from 'open highways'. Net neutrality regulations ensure equal access at the point of delivery, and promote what I believe to be the fairest competition for content and service providers. If the FCC rolls back net neutrality protections, ISPs would be free to charge site owners for priority service. This goes directly against the idea of an open web, which guarantees a unfettered and decentralized platform to share and access information. There are many challenges in maintaining an open web, including "walled gardens" like Facebook and Google. We call them "walled gardens" because they control the applications, content and media on their platform. While these closed web providers have accelerated access and adoption of the web, they also raise concerns around content control and privacy. Issues of net neutrality contribute a similar challenge. When certain websites have degraded performance because they can't afford the premiums asked by ISPs, it affects how we explore and express ideas online. Not only does it drive up the cost of maintaining a website, but it undermines the internet as an open space where people can explore and express their ideas. It creates a class system that puts smaller sites or less funded organizations at a disadvantage. Dismantling net neutrality regulations raises the barrier for entry when sharing information on the web as ISPs would control what we see and do online. Congruent with the challenge of "walled gardens", when too few organizations control the media and flow of information, we must be concerned. In the end, net neutrality affects how people, including you and me, experience the web. The internet's vast growth is largely a result of its openness. Contrary to Pai's reasoning, the open web has cultivated creativity, spawned new industries, and protects the free expression of ideas. At Acquia, we believe in supporting choice, competition and free speech on the internet. The "light touch" regulations now proposed by the FCC may threaten that very foundation. If you're also concerned about the future of net neutrality, you can share your comments with the FCC and the U.S. Congress (it will only take you a minute!). You can do so through Fight for the Future, who organized today's day of action. The 2015 ruling that classified broadband service under Title II came after the FCC received more than 4 million comments on the topic, so let your voice be heard. This guide looks at why open source approaches are good for governments at all levels.